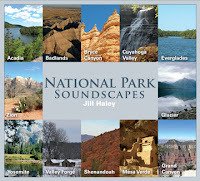 Jill Haley is an oboist, English horn player, pianist, and composer who has written and released 4 recordings about the National Parks in the United States. Her most recent release National Park Soundscapes is a reflection of the beauty in nature that surrounds us and can be found all over the U.S. The album which is a digipack, features all 12 parks pictured with photos by the artist as well, all encapsulated into new age and classical instrumental pieces. Music is the eternal communicator and something all of us can understand and interpret in our own way. The beauty of the instrumental album creates and continually supports that thought process. Jill’s oboe playing is soothing and flowing much like the way nature takes its course on a daily basis. “Prairie Grass Dance” is like the heartbeat of the prairie as the grass dances in the wind. The strumming rhythmic guitar lays the groundwork for Jill’s work to take hold, courtesy of husband David Cullen. The ear catching toe tapping track gets your attention immediately and keeps you. It easily became one of my favorite songs on the album. Dana Cullen, the couple’s daughter also lends her talents to the recording with the horn and son Graham with the cello, making it a true family affair. “Shenandoah Stillness” offers a soft piano to invite you in to another world that is quite different than the previous one you just visited. And as the acoustic guitar is introduced the colors and textures change and become fuller of life and energy. This is the theme that carries you through this recording, all the varying degrees of sights and sounds each National Park can offer. The following track “Towers and Kivas” really caught my ear as well. The husband and wife chemistry is quite evident as David’s fine strumming acoustic guitar sets the rhythm and pace then as Jill adds her lovely oboe to the mix, well it’s like magic. I appreciated the energy right from the start with the guitar and the way the oboe balanced everything out so nicely with its warm textures. Each track paints a different picture on the musical canvas offering the same diversity each National Park does allowing the project to focus on a true feeling of synchronicity or oneness with nature if you will. I not only appreciate expressive instrumental new age music I honestly respect and admire our surroundings. Mother Earth needs our care and protection and perhaps this project will serve a gentle reminder of that. I would not change a thing about National Park Soundscapes it is simply beautiful and picturesque just like its namesake. It doesn’t hurt to have an appreciation for new age classically influenced music either. Any way you look at it this one is a keeper and although I chose three keys tracks as I always do, I think the entire album was an absolute joy for the senses.